WASHINGTON, D.C. -- Gallup's Economic Confidence Index averaged -11 in December, which is slightly better than the monthly averages of -12 to -14 measured from July through November. 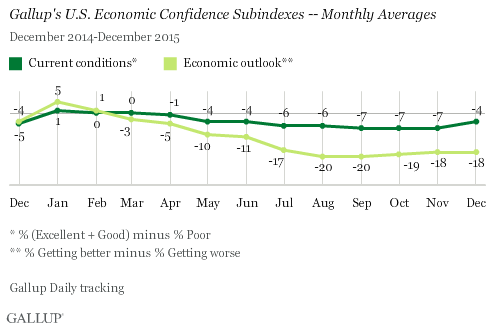 Americans' economic confidence was slightly lower in December than earlier in 2015, but generally better than it has been since 2008. 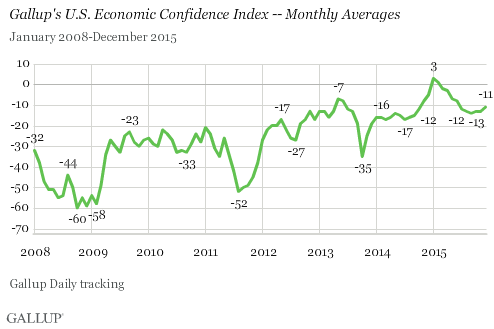 The Economic Confidence Index rose sharply in late 2014 and early 2015 coincident with falling gas prices. In January, Gallup's index reached positive territory, with a monthly score of +3, for the first time since the recession. Confidence ebbed slightly in March and April, returning to negative index scores. From May to September, though, the index dropped a bit each month, dipping as low as -14 in September. It has since remained below -10. The latest weekly index reading, based on Dec. 28-Jan. 3 Gallup Daily tracking, is -10, perhaps signaling a slight improvement in confidence given the recent weekly scores of -11 and -12. Gallup's index is the average of two components: how Americans rate current economic conditions and whether they believe the economy is improving or getting worse. The index has a theoretical high of +100, if all Americans rate the current economy positively and say it is improving. It has a theoretical low of -100, if all Americans rate the current economy poorly and say it is getting worse. The slight improvement in the overall index in December is attributable to Americans' improved views of the current economy. In December, 25% of Americans rated current economic conditions as "excellent" or "good," while 29% rated them as "poor." This resulted in a current conditions score of -4, up from -7 in each of the prior three months and the highest since June. Meanwhile, the economic outlook score was -18, matching November's score. This was the result of 39% of Americans saying the economy is "getting better" and 57% saying it is "getting worse." Americans' outlook for the economy is similar to what Gallup has measured since July, but remains down significantly from earlier in 2015. 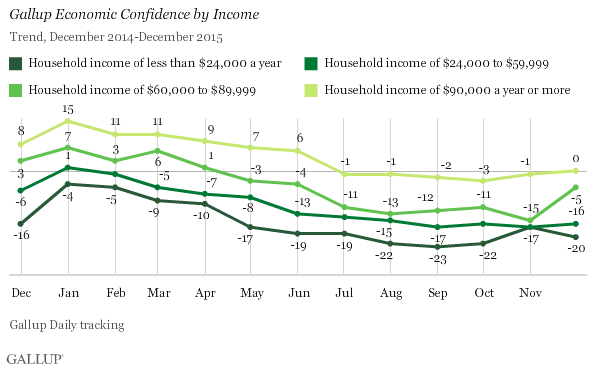 Not surprisingly, Americans' confidence in the economy is related to their own financial situation. Those in the highest-income households consistently have more confidence in the economy than those in households with the lowest annual incomes. The highest income group, those earning $90,000 or more a year, are neutral overall about the state of the economy, with an index score of zero. Americans with annual household incomes between $60,000 and $89,999 are slightly negative in their views of the economy, with a score of -5. Americans living in households that make less than this are even more dismal about the national economy. The index score for those in households earning between $24,000 and $59,999 is -16, and the score for those earning less than $24,000 is an even lower -20. The story of the trajectory of the U.S. Economic Confidence Index over the past year could be told in two chapters. The first is a period of some of the highest scores Gallup has recorded since 2008, and the second is one of stability. While the Dow may not have ended 2015 with the strength it had in the spring and early summer, it concluded the year at a higher level than the depths it plunged to in August and September. And December marked the lowest gas prices the U.S. has seen in more than six years, while some project even lower prices in the year ahead. But given that gas prices fell throughout the second half of the year and this didn't seem to affect the index, further drops in 2016 may have limited influence on confidence because Americans have become accustomed to low prices. This comes as the national unemployment rate is projected to remain at its seven-year low. There have been some signs in recent weeks of slight improvement in Americans' evaluations of the economy, with confidence in December returning to a level not seen since June. Results for this Gallup poll are based on telephone interviews conducted Dec. 1-31, 2015, on the Gallup U.S. Daily survey, with a random sample of 13,648 adults, aged 18 and older, living in all 50 U.S. states and the District of Columbia. For results based on the total sample of national adults, the margin of sampling error is ±1 percentage points at the 95% confidence level. All reported margins of sampling error include computed design effects for weighting. 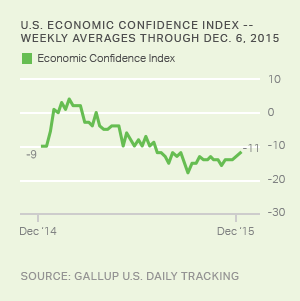 The U.S. Economic Confidence Index measured -12 for the week ending Dec. 13. Since September, scores have remained within a four-point range.